Couscous is a form of pasta. It comes in various forms. Traditional couscous are crumbs of semolina and water that are cooked by steaming in a special utensil called a couscousier. This is common across the Maghreb and south into West Africa. Much of the couscous on the American market is a precooked version that is ready in a matter of minutes. All you have to do is follow the directions and put the couscous in boiled water, broth or juice and allow the couscous to sit and absorb the liquid. Israeli couscous—or pearl couscous—is uncooked and requires a little more work but can be used in similar ways. Israeli couscous holds up better when added to stews and soups and works great for salads. You may be asking yourself, what is this Black boy of supposed Southern origin doing talking about couscous? Well couscous is a part of both my African and Jewish selves. It was brought into West Africa by Arab and Jewish traders who then stayed and became part of the population. Yes, Virginia there were West African Jews in medieval times! In North America, words like “kush,” and “coush-coush” became part of the language of the American South. In the Southeast, kush referred to cornmeal scramble—and it looks very much like couscous even though the flavor is not the same. Coush-coush is “Acadian French,” (it’s really Bamana, Manding, Fulani and Wolof influence from Senegambia—in Louisiana). It refers to a cornmeal porridge made in the old days, often eaten for breakfast with cane syrup. It makes sense that the very region from which enslaved Africans from the Muslim world came would bring those tastes to the New World. People AND food are complicated. Nothing is as it seems. We are constantly reinventing our food culture as a species. We can trace people’s lives and stories even as we trace the movement of food. These little details connect us to our past and bond us with the generations that have gone by, those whom we share our planet with, and those who will follow us and tell our stories and prepare our recipes. PLAY with this recipe. This is edible jazz!!! IMPROVISE! DANCE IT! Couscous likes things like dried fruit and almonds and “sweet spices,” turmeric, and ginger. It also loves mint, onion, garlic, allium flavors and broths and essences. It’s extremely versatile. This salad is a fantastic quick side dish or base of a main dish for a spring or summer lunch. As we move into onion and garlic and pepper seasons—you can add whatever you like to your leftover couscous salad. Put it in a bowl and mix it. Add more vinegar or olive oil and cover and allow it to chill and set for an hour or two. You can add almonds or peanuts, tofu or tempeh, meat, poultry or seafood to make this a more “main course,” salad. Mint can be substituted for parsley if you are serving it as a side salad. Looks Yummy! Gonna try and let you know. I just made “Fried Green Tomatoes” today. Just a little indulgence. I loved this post. I never thought of these of these couscous connections before. The salad looks great, too! Nice post, Michael. Shared with a great pal tonight who quit his horrid job today for all the right reasons — and — just happened to have a pan of couscous in the fridge. In the altogether, he thought the timing was awesome! Thanks Michael, for advice on leftover couscous. The product was eaten along the precolonial caravan trails of the western and central Sahel / Sahara and somewhere I do have a blog entry about that. A very interesting topic, the history of couscous and its following of trade merchants and others. And its continued use today. Kush is a cornmeal scramble or hash made from leftover cornbread crumbled and cooked with new ingredients. Love the post on couscous! 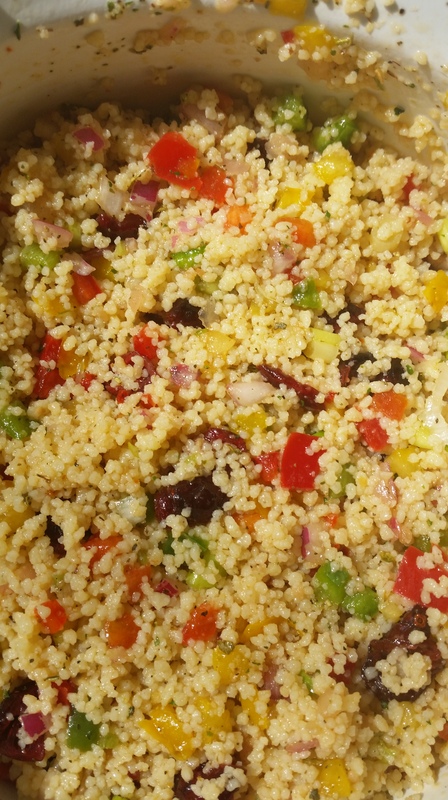 I recently began preparing couscous, as a side dish, for a Sunday meal — the family loves it! The couscous has a great flavor when cooked in broth. I’m glad you enjoy it. I wonder if we can find other ways to resurrect leftover couscous!